Nestled amongst the newly established Souq on the shores of the Arabian Gulf, Souq Al Wakra Hotel Qatar by Tivoli has just launched in Al Wakra, the up-and-coming seaside district just a 20-minute drive south of Doha. Having established itself as a prominent coastal settlement for pearl divers, sailors and fishermen, Al Wakra has flourished as a trading post since the 17th century, but growth slowed down when supplies ran out. Recent investment has resulted in efforts to preserve and revive heritage sites, including the development of Souq Al Wakra Hotel Qatar by Tivoli. Blending artful Qatari tradition and contemporary leisure, the new hotel comprises of two buildings with a total of 101 guest rooms. Both buildings are former heritage houses where original character has been splendidly preserved with the architecture mirroring a Qatari house or fortress. In keeping with the local heritage, each of the guest rooms and suites features classic thatched roofs, reflecting traditional basket weaving elements. The guest rooms have been thoughtfully designed with colourful motifs reflecting the jubilant blues of the sea and the sandy tones of the desert, inspired by Al Wakra’s history as a pearl diving and fishing village. Open walkways and maze-like paths lead to courtyards where multiple guest rooms can be blocked off to create private areas for groups. Offering ultimate privacy, large parties can stay together in guest rooms grouped around authentic Qatari majlis, perfect for celebrations or family gatherings. Historically a majlis was a gathering place for people to discuss family and business-related issues and announcements, a true symbol of Arabian hospitality for centuries. The tradition is now widely used in Qatari homes as a place for convivial events and meetings. Souq Al Wakra Hotel Qatar by Tivoli has created dining delights in five restaurants and lounges. Jarnen offers Mediterranean all-day dining with fresh seafood sourced daily from the local Al Wakra market and BBQ grilled to order at live cooking stations. Markhan, an Arabic fusion lounge, offers the ideal place to enjoy the sunset from the terrace overlooking the gulf. Emshoot invites guests to discover the culinary delights of Asia’s diverse flavours and dishes ranging from sushi to tandoori kebabs. For those looking for something lighter, guests can dine upstairs and embrace the sights and sounds of the nearby Souq from Mahaadeg’s terrace, which serves a selection of international dishes. Whether needing to grab breakfast on the go or an afternoon snack, the Lobby Lounge tempts palates with a range of quick bites. 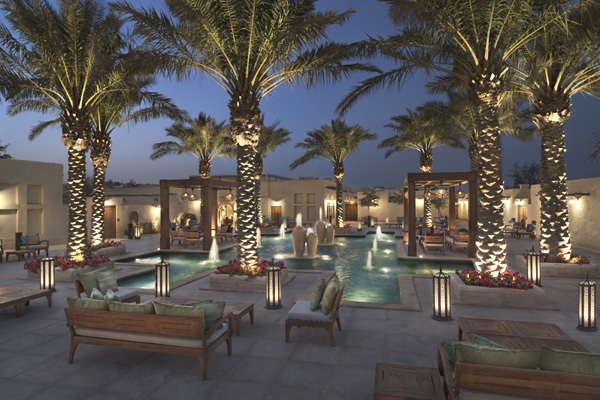 In addition, the colourful majlis, situated across the property, offers an authentic Bedouin-style evening or live BBQ. The comfortable spaces are perfect for groups to share quality time whilst enjoying a casual and convivial atmosphere. To complement the waterfront location, Tivoli Spa provides an absolute state of relaxation and well-being with separate treatment rooms for men and women as well as a hydro pool, steam room, Vichy Shower and jacuzzi. High-end spa products effectively target the physical signs of stress and fatigue. A multifunctional gym in each building is also available for all guests. Only a 15-minute drive to Doha’s Hamad International Airport, the hotel is an easily accessible location for business meetings, with both a multipurpose boardroom equipped with the latest audio-visual equipment and a business centre available in each building. The hotel also has direct access to the adjacent Al Wakra public beach and promenade, suitable for running and walking.